The following account of Caitanya's philosophy is mainly based on Śikṣāṣṭaka (the ten basic verses) ascribed by the Gaudīya (Bengal) Vaiṣṇavas to Caitanya himself. yet what he actually preached, as would appear from Śikṣāṣṭaka as well as from the accounts of his teachings by his disciples, was a form of Bhedābheda or difference-in-non-difference which was very near the position of Nimbarka. but also an essential a-bheda or non-difference in spite of the eternally fixed distinction, an a-bheda or non-difference despite difference which is not Intelligible to the logical understanding. It should, therefore, be known as it rightly is, not as a form of dualistic personal Idealism as we have in Mādhvaite Dvaita-vāda, but as a-cintya-bhedābheda or a form of idealistic Monism that reconciles all dualities in a super-logical unity or whole that surpasses strict logical comprehension. Common to all Schools of Vaiṣṇavas is their acceptance of the reality of the world and the rejection of māyā-vāda and its concept of jagan- mithyātva or falsity of the world as adopted by Śankara. This is a common feature not merely of all Vaiṣṇava sects but also of all Śaivas and Śaktas, i.e. all who acknowledge the authority of the Āgamas and accord to them the status of revealed Scriptures. the Caitanyaites as believers in the reality of the world would reverse the relation, making nir-guṇa Brahman a passing phase or stage in the progress to the complete Truth which is the realization of Brahman as the Lord of Creation in intimate relations of love and affection with His creatures. from those of Rāmānuja and Madhvācārya, who conceive the Lord in the form of Viṣṇu or Nārāyaṇa with Lakṣmī as His Consort or Śaktī in Vaikuṇṭha, which is to Rāmānuja and Madhvācārya what paradise is to the Christians. so that while one can prostrate oneself before Him and otherwise show one’s reverence for His surpassing great­ness and glory, one can do it only from a distance never daring to come in intimate living contact with Him. It is otherwise, however, in the conception of the Lord and His Śaktī as Rādhā- Kṛṣṇa where one has a taste of the Lord’s companionship in Vrindāvana-līlā in intimate human social relationship as friend, child or beloved. than the one that is afforded by the Lakṣmī-Nārāyaṇa concept with its stress on greatness and glory. as distinguished from the aiśvarya-rūpa wherein the Lord appears in his transcendent glory and power (e.g. four-handed as in the case of the Lord’s appearance in Dvārakā). Thus though both the forms afford scope for devotion or bhakti, yet while the latter affords scope for bhakti only as awe, submission and reverence, in the former bhakti takes the more intimate form of affection, fellowship and love. Of the ten ślokas or verses of Śikṣāṣṭaka, the first deals with the question of pramāṇa or source of valid knowledge while the remaining nine verses expound the prameyas or ultimate objects of knowledge recognized by the followers of Caitanya. According to the first śloka, the Vedas constitute the real pramāṇa and perception, inference and the so-called other pramāṇas are sources of valid knowledge in so far as they conform to the fundamental teachings of the Vedas and expound the nature of reality consistently with the Vedic declarations. Mere logic has no competence in the determination of the ultimate reality. In so far as arguments are based on Vedic teachings and purport to expound the contents of Vedic declarations they have any scope in the determination of the spiritual reality. A reality that is spiritual surpasses the limits of ordinary, discursive thought. Ordinary thinking and reasoning follow in the wake of perception and have application therefore to such spatio-temporally limited objects as can be perceived by the senses. Therefore both perception and ordinary logical thinking are at home only in the domain of the sense-perceived material world (jaḍa Jagat). perception and ordinary thought are of no avail and must be super­seded by some higher mode of experience such as is attributed to sages and seers (Ṛṣis). Hence in the determination of the ultimate spiritual reality, the Vedas are our true guide—the Vedas, i.e. as the records of the higher, mystical experiences of seers and sages. What are the deliverances of the Vedas as regards the prameyas or ultimate objects of knowledge? and a mere fraction of Hari’s essence (amśa) is the Paramātman or the supreme Self as the indwelling spirit of the created world. Hari is the whole (aṁśin) of whom Paramātman is the part (amśa) and Hari is the central reality of whom the radiating halo is the nir-viśeṣa Brahman. Hari is the unity of perfect beauty (śrī), perfect majesty (aiśvarya), perfect strength (vīrya), perfect glory (yaśas), perfect intelli­gence (jñāna) and perfect detachment (vairāgya). He is the embodiment of these six attributes in their unthinkable plenitude. These attributes are not all of the same rank, being related, as they are, as primary and subsidiary. Śrī or perfection of beauty is the most fundamental of these attributes being related as aṅgin (primary, principal or essential) to which majesty, strength and glory function as subsidiaries. What we call jñāna or intelligence and vairāgya or detachment in the Lord are only an effulgence of the Lord’s attribute of yaśas or glory. Hence jñāna and vairāgya, the two qualities which Śankara stresses are attributes of a subsidiary attribute of the Lord and this explains why they appear as the halo of the Lord’s person or figure. As these two attributes constitute the essence of Śankara’s Indeterminate Absolute, Brahman as thus con­ceived is no independent reality but only an adjectival aspect of Hari as plenitude of being, joy and consciousness. Just as the light of a burning fire presupposes the fire as its source and substrate, so does the Indeter­minate Brahman as the halo of the Lord presuppose the Lord s spiritual person as its source and substrate. And Lord Hari in His completeness is the duality-in-unity of Kṛṣṇa and Rādhā (as the Lord and His Śaktī or energy), each bound to the other in inseparable bonds of devotion, love and affection. What is known as the Paramātman or the indwelling spirit of the world is a fragmented or fractional Incarnation of Hari as the Lord in His completeness and perfection. Hari has created the world of māyā or nescience with the help of His two attributes of majesty and strength and having created it, has entered or charged it with a fraction of His essence in the form of Viṣṇu. Though a fraction of Hari, Viṣṇu as the world-soul does not yet fall short of the perfection and plenitude of the Lord Hari, who is His source. For it is true of the infinite spiritual reality that not only is it complete and infinite as an infinite, all-inclusive whole outside which nothing is, but also that a part (amśa) of the infinite can also share the infinitude of the whole of which it is a part. And so it has been said that subtraction of even the infinite from the infinite leaves yet the infinite intact without diminution. The question is raised as to how the Lord, Hari, who is infinitude of being, joy and consciousness yet has the form of Kṛṣṇa which is limited in space. To have a figure or form is not only to lose the property of omnipresence or infinitude but also to be limited in will and efficiency. In reply to this it is pointed out that the objection arises from a mistaken transference of the qualities of material bodies to objects which are spiritual in essence. So far as material objects are concerned, these, as unequal aggregations of sattva, rajas and tamas reveal the properties of limitation in space and time so that for a material body to be in one place at one time is to be absent from all other places at the same time. But the figure of Lord is a spiritual form consisting of pure, unmixed sattva (śuddha- sattva), and not, as in the case of material bodies, of miśra-sattva or sattva mixed with tāmasika and rājasika elements. And so while it is impossible for a material body to be in one place and also in all places at the same time, this is not at all impossible for a spiritual figure made of śuddhasattva as the Lord’s person is. It is, in fact, one of the a-cintya or unthinkable attributes of the Lord that He may be limited and clearly defined in outline and figure and also be everywhere in His clearly distinguishable form at the same time. The unthinkable properties which distinguish the Lord’s figure or person also characterize His sva-rūpa or essence and His manifold powers. so that while the Lord in one respect is non-different from the various energies(śakti) He exercises, He has also a transcendent nature which is not exhausted in the different manifestations of His essence. Nor are the powers which the Lord exercises in His different manifestations intelligible in strict logical terms. and māyā-śakti or power of materialization and insentience in the form of an inanimate world. or how the infinite spiritual reality may yet split itself into innumerable limited spirits without prejudice to its integrity of being, is one of the mysteries of the ultimate Reality which defies logical resolution. What precisely, then, is this sva-rūpa-śakti which is supposed to function in the three forms of cit-śakti, jīva-śakti and māyā-śakti? Since the Lord’s essence (sva-rūpa) consists of being, consciousness and joy (sat, cit and ānanda), His inherent energy (sva-rūpa-śakti) must also consist of a joy (hlādinī) in being (sat) which is also the experience or consciousness (cit) of the joy in being. Thus the three aspects of the sva-rūpa-śakti are hlādinī corresponding to the joy, sandhinī corresponding to the being and saṁvit corresponding to the experience or consciousness thereof. its taṭastha or extrinsic determination as arising only through the Absolute (Brahman) appearing falsely through the veil of nescience as creator, maintainer and destroyer of a world (sṛṣṭi-sthiti- laya-kartṛttva). Therefore for followers of Śankara while being, conscious­ness and joy define Brahman’s nature truly, the relational characters are unreal appearances which do not belong to Brahman’s essence. Since for followers of Caitanya (as also for all Schools of Vaiṣṇavites) the world of experience is not an unreal appearance, the question of an absolute division between the sva-rūpa or essential and the taṭastha or relational characters does not arise. The taṭastha or relational characters are thus the sva-rūpa or essence itself in different aspects of its manifestation. but the diverse mani­festations of the Lord’s sva-rūpa-śakti as hlādinī, self-enjoying, sandhinī, self-realizing or self-positing and saṁvit, self-apprehending or self- conscious. What, then is cit-śakti, and what is its character as a śakti or power of the Lord’s essence (sva-rūpa) as being, joy and consciousness? i.e. the unity-in-duality of the Lord, Kṛṣṇa and His Śaktī, Rādhā, each as the other of the other and yet non-different from the other. In the aspect of hlādinī, this realization consists in the reciprocal love of Kṛṣṇa and Rādhā just as in sandhinī it shows itself as the Lord’s immaterial world (Vrindāvana) and its paraphernalia and as saṁvit as the experience of the joy or delight in this unity-in-duality. The cit-śakti is otherwise called antaraṅga-śakti, a centripetal force of concentration and inwardization whereby not only the whole is apprehended in its integrity as individual unity but also every element of the whole as the whole itself in an essential aspect of its being. It may thus be called a capacity to intuit the many as one and the one as many, a capacity to realize the spirit as a true spiritual unity obliterating all fixed distinctions and resolving external disjunctions into internal spiritual relations. In direct contrast to cit-śakti is māyā-Śakti which also is a form of the Lord’s sva-rūpa-śakti. While as cit-śakti, the sva-rūpa-śakti reveals the Lord as the ultimate spiritual reality as the all-inclusive spiritual unity of all that is, as māyā-Śakti it reveals Him as the insentience of the material world and its atomistic, sensuous values and interests. whereby the spiritual appears as insentient and purely material and the integral total point of view gives way to one of atomistic pluralism and particularism. in māyā-śakti there is a complete reversal of the outlook so that the integral, total viewpoint is substituted by one of fragmentation and particularization. And so while cit-Śakti delivers the truth in its com­pleteness without distortion, māyā-śakti gives us only an inverted image or imitation thereof (chāyā). In this way, through the influence of māyā- śakti, the particular appears not, as it really is, as a subservient element of the whole, but as itself the whole possessing absolute value and sig­nificance in itself. Further, while cit-śakti apprehends the spiritual as an immaterial spiritual reality, māyā-śakti reveals it as the insentience of the inanimate material world in which consciousness is in eternal slumber. Between the complete truth as delivered by the Lord’s cit-śakti and the distorted imitation or copy thereof as presented by the Lord’s māyā- śakti, stands jīva-śakti which is the Lord’s sva-rūpa-śakti appearing in the form of limited finite selves or spirits. As standing between the opposites of Truth and its distorted imitation, jīva-śakti reveals itself as a dual capacity for a spiritual as well as an unspiritual outlook. It is thus otherwise called taṭastha-śakti suggestive of the dual nature of the finite individual as belonging to both earth and heaven at the same time. Just as the river-bank may be said to belong to the river as well as the surrounding land, so is the jīva the link between the Lord, in His intrinsic character as the all-inclusive spiritual reality and His extrinsic disrupted appearance as the insentience of a material world of unrelated particulars. The Lord, in other words, appears as jīva-śakti in so far as He splits Himself into infinitesimal spiritual monads bound to the Lord’s spiritual essence or sva-rūpa on the one side and limited by its appearance as a material world on the other. And so while the Lord remains essentially the infinite, all-pervasive spirit which He is, as jīva He becomes finite, limited, monadic, as liable to be led astray by the allurements of māyā- śakti as capable, in virtue of sharing the Lord’s spiritual essence, of extricating himself from the snare. Since jīva-śakti is nothing but the Lord’s sva-rūpa-śakti in one aspect of its manifestation, it also must reveal, though in a limited form, the being, joy and consciousness that constitutes the Lord’s sva-rūpa or essence. Just as a burning fire gives off sparks from itself which share, in fragmented form, the nature of the source which gives them off, so does the Lord as the integral spiritual reality throw out jīvas as the sparks of its integral being. As such, jīva is both different and non-different from the Lord, non-different as being made of the Lord’s spiritual essence consisting of being, joy and consciousness, and different as sharing the essence in limited form conformably to its monadic nature. the jīva as sharing the Lord’s essence in a monadic infinitesimal form is liable to be mastered and subjugated by māyā (māyādhīna). 2. as avidya or power of nescience in the jīva causing it to forget its real nature as eternally subservient to the Lord and making it set up as an independent absolute possessing self-existence. It is avidya and the forgetfulness that it pro­duces that account for the un-divine self-assertion of the finite self and this explains the exaggerated values that are ascribed to the finite as such and the suffering and frustration that result therefrom. The material world, though a product of māyāśakti and its power of distortion, is not, however, an unreal appearance. On the contrary as a product of the Lord’s sva-rūpa-śakti in the aspect of māyā-śakti, it shares the reality of its source and is a very real snare to the limited, monadic jīva. But while it is true that as a real material world it is the source of a very real confusion in the individual jīva, it is also equally true that it is not eternal or everlasting either in itself or in its influence on the finite spirit. learns through repeated frustrations and failures the vanity of its earthly ways and turns at last to the divine way as the truth and essence of its being. What, then, is this divine way as distinguished from the un-divine and the earthly way? It is, according to the followers of Caitanya, a way of life in accordance with the jīva’s true nature, the way, i.e. of bhakti, self-dedication and love wherein the finite spirit awakes to a realization of its real status as a spark of the divine Spirit and eternally subservient to its will. The earthly way is the way of self-will and self-assertion whereby the individual forgetful of its eternal subservience sets itself up as an independent absolute with a spurious claim to have its own way in all things. It is only as by repeated frustration and failure it learns the lesson of its real limitations that it begins to reflect on its true nature and realize its position as a subservient element of the spiritual whole. not as a self-existent, independent absolute as it mistook itself for, but as eternally subservient to the Lord. gradually spreads over the whole being of the finite spirit permeating its thoughts, its emotions and its will. In this way what at first appears as abstract, cold intellectual assent becomes at last a complete self-giving, an unconditional self-dedication of the whole nature, intellectual, emotional and conative. but all finite values, including the social and moral values of finite group life, are merged in and subordinated to the integral absolute life. When this stage is reached, there is straining of the entire personality towards the integral, whole life—a straining of the soul which is not merely contem­plative surrender, which, at its best, is only negative self-emptying, but also a burning desire as a soul-hunger and a soul-thirst that will not be appeased by anything short of the integral complete life. This is rāgātmikā- bhakti—bhakti not merely as an intellectual seeking or discovery, but a straining in every fibre of being for the integral, absolute life as an eternally subservient element of the Whole. 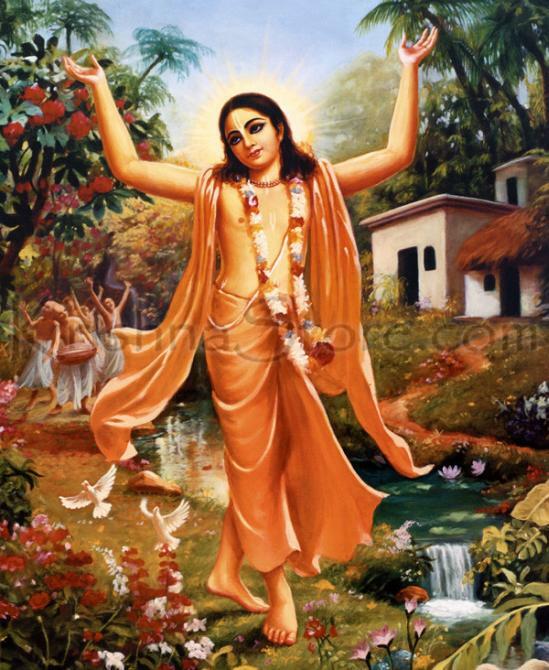 The culmination of rāgātmikā-bhakti is mahā-bhāva which in the jīva is the imitation (cāyā) of its divine archetype as represented in the reciprocal love of the Lord, Kṛṣṇa and His śakti, Rādhā, the love that makes each find its fulfilment in the other and feels incomplete and void in the absence of the other. Bhakti which defines the jīva's spiritual destiny is only life according to jīva's true nature as a monadic fraction of and therefore eternally subservient to the Lord’s perfection and fullness of being. As such, bhakti is something that belongs to the jīva by nature and is not an acquisition or addition ab extra to the regenerate soul. All jīvas, in other words, are by nature bhaktas or devoted servants of the Lord as fractions of His essence or sva-rūpa as being, joy and consciousness. and who, as denizens of these divine spheres, live permanently beyond the range of māyā-Śakti and never fall a victim to its allurements. It is otherwise with the baddha-jīvas,the earth-bound souls, who live within the sphere of māyā’s influence and are therefore liable to be deluded and led astray by its charms. In their case the inherent bhakti lies dormant at first till the individual through the hard school of experience realizes the error of his earthly ways and discovers at last the divine way as the path to the fulfilment of his spiritual destiny. When this happens, the inherent bhakti in the jīva awakes from slumber and reveals the individual in his true character as a servant eternally bound to the Lord by the bond of service, devotion and love. The awakening to bhakti and love in the case of the earth-bound soul is thus reminiscence or self-discovery rather than an acquired quality. Besides the two broad classes of jīvas as baddha or earth-bound and nitya-mukta or eternally free, there are sub-classes of earth-bound souls corresponding to their level of spiritual perfection and progress. Thus we have not merely the three classes of plants, animals and humans amongst the earth-bound souls but also amongst the humans themselves different levels of spiritual perfection and progress. For example, while some humans live a purely earthly life in utter forgetfulness of their real status as eternal servants of the Lord, there are others who prefer a spiritual life of devotion and love consistently with their destiny as monadic fractions of the absolute Spirit. The idea of the finite spirit as finite, limited and therefore eternally dependent on the Absolute as the inclusive whole is the beginning of bhakti. When the abstract idea through heightening of consciousness becomes intensified into an intuition, the bare thought has passed over into the warmth and intimacy of devotion and love. Bhakti psychologically is thus knowing intensified and trans­formed into an intuitive realization—intellection, consciousness or thought so condensed and concentrated (cid-ghana) as to amount to a living, presentative experience. Thus while in the content aspect bhakti is the realization of the jīvas eternal dependence on the Lord, psychologically it is a form of intellectual intuition which transforms the entire personality, intellectual, emotional and conative. The relation between the Lord, the jīvas and the material world is, as already noted, a relation of unthinkable difference-in-non-difference, not definable in strict logical terms. While jīva-śakti and māyā-śakti are themselves aspects of the Lord's sva-rūpa-śakti, yet the Lord has also a transcendent nature which remains complete and unchanged in spite of His exercise of the different powers. And while the Lord as both immanent in and also transcending the functions of His various powers reveals Himself in unthinkable difference-in-non-difference from the powers He exercises, the powers themselves as cit, jīva and māyā-śaktis are also beyond comprehension both severally and in their mutual relation. This is why the followers of Caitanya describe their standpoint as a-cintya- bhedābheda which must be distinguished alike from Brahma-vivartta- vāda and Brahma-pariṇāma-vāda. the followers of Caitanya consider the world to be real as a house of correction for the jīva or finite soul though in unthinkable difference-in-non-difference from the absolute Reality. In Brahma-pariṇāma-vāda again the world, though considered to be real, is yet taken to be a pariṇāma or substantial modification of Brahman, the absolute Reality. but as the transformation of its a-cintya-śakti, i.e. of the inscrutable powers of its sva-rūpa as cit- jīva- and māyā-śakti. This, while saving the integrity of Brahman in its transcendent being yet makes it one with the world through its supernal powers in an unthinkable difference-in-non-difference, a-cintya- bhedābheda.